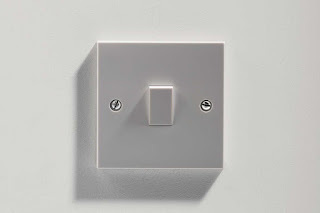 an on-off switch is their visible icon..
are made of the consciousness stuff which is not stuff..
Consciousness feels like an on-off phenomenon: either you’re awake and experiencing the world or you’re not. But finding the button, or even the dimmer switch that allows our brains to move between these states, is tricky. “Consciousness is not something we see, it’s something through which we see, which makes it challenging to study,” says George Mashour, director of the Center for Consciousness Science at the University of Michigan in Ann Arbor. One common definition of human consciousness is “the thing that abandons us when we fall into a dreamless sleep, and returns when we wake up”. But it probably comes in different levels. Say I anaesthetise you: you may be able to hear my voice, but not respond to it; you may be dreaming and not hear my voice; or you may hear or experience nothing at all. Because we are reliant on people’s subjective descriptions of their experience, it is difficult to correlate these different levels of awareness with specific patterns of brain activity. “The bottom line is, I really don’t know if you’re conscious of me, conscious of something else or not conscious at all,” says Mashour.